North by Northwest (1959) is a suspenseful, classic Alfred Hitchcock caper thriller. The box-office hit film is one of the most entertaining movies ever made and one of Hitchcock's most famous suspense/mystery stories in his entire career. 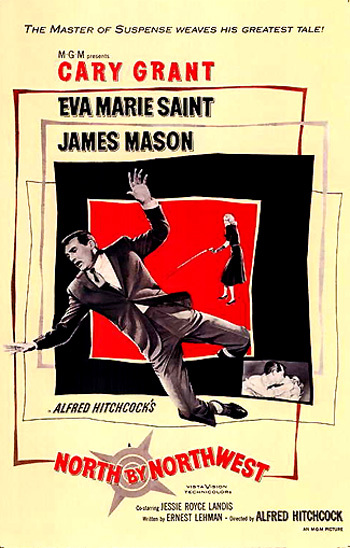 One of the film's posters advertised: "Only Cary Grant and Alfred Hitchcock ever gave you so much suspense in so many directions." The film paired debonair Cary Grant with director Hitchcock for the fourth and last time: their earlier collaborations were in Suspicion (1941), Notorious (1946), and To Catch a Thief (1955). And Hitchcock also chose Oscar-winning Eva Marie Saint as the blonde heroine (to the studio's and Grant's surprise) - one of many such female characters in his film repertoire. The film's themes include many plot devices and elements typical of Hitchcock films (especially The 39 Steps (1935) and Saboteur (1942)) - predominantly the themes of mistaken identity for the innocent, ordinary, 'Wrong Man' hero. Another of its themes is false pretenses and survival in 20th Century America during the Cold War. [Note: The Leo G. Carroll character in the film - the head of the American Intelligence Agency, was possibly modeled after two 1950s real-life figures: Secretary of State John Foster Dulles and his brother Allen W. Dulles, head of the CIA.] Arthur Hiller's Hitchcockian Silver Streak (1976) paid homage to this film, with a similar train ride, dangerous circumstances, pursuit by police, and a mysterious woman. The quick-paced, glamorous espionage thriller includes a tongue-in-cheek odyssey away from the city - a perilous adventure for a man who is normally sheltered by his wealth and prestige. A light-hearted and complacent hero/bystander (a successful Manhattan advertising executive in a corporate Brooks Brothers suit) is suddenly totally vulnerable, isolated, and caught up in an unexplainable series of events - after being accustomed to making up 'the truth' with slick ad copy for marketing purposes. After an abduction, he is victimized (mistaken for a government undercover Federal agent by a group of foreign spies), and then on-the-run as an implicated murder suspect (after being framed for a UN official's murder). He is pursued (cross-country across part of the US) by a seeming conspiratorial group of spies, the police, and the FBI. The American is eventually forced to assume another man's identity (George Kaplan, a non-existent US agent), while confronted with murder, mayhem, a world of spies and counterspies, a domineering and unbelieving mother, and an untrustworthy, mysterious blonde, femme fatale lover. His final salvation occurs on the Presidential faces carved on Mount Rushmore - the most modern American image of all. As with many of Hitchcock's films, there were Academy Award nominations, but no Oscars. This film was nominated for three awards: Best Story and Screenplay (Ernest Lehman), Best Color Art Direction/Set Decoration, and Best Film Editing (George Tomasini). [Note: Some believe that the film's premise was based on the famous 1956 international espionage case titled: "The Galindez Affair."] The film also included a superb score by Bernard Herrmann. However, there were no nominations for Best Picture, Best Director, or Best Score, to name only a few. From the killer plane in the cornfield to the cliff-hanger on George Washington's nose, it's suspense in every direction! The director's familiar MacGuffin in this film (the device or plot element that catches the viewer's attention or drives the logic of the plot) is the secret information sought by the spies, and secondarily, the mistaken identity at the film's start. Hitchcock's classic is filmed mostly in brilliant sunlight (especially in the famous crop-dusting scene) in glorious Technicolor, unlike so many other thrillers or dark film noirs, and the film takes full advantage of the wide-screen VistaVision process. Ah, Maggie, in the world of advertising, there's no such thing as a lie. There's only the expedient exaggeration. You ought to know that. One of his friends alludes to his heavy drinking habits: "You may be slow in starting, but there's nobody faster coming down the homestretch." He insists that he must send his mother a wire from the bar. While a "George Kaplan" is being paged [a ruse to convince espionage agents that Kaplan exists], Roger signals and beckons to a bellboy. The chance coincidence of timing causes two men in the lobby to mistakenly identify him as "Kaplan." As he walks back into the lobby to send the telegram, he is strong-armed and accosted by the two sinister-looking thugs who carry concealed weapons. Kidnapped, he is forced into a waiting car and imprisoned there without any means of escape, sitting between the two silent, incommunicative men. Soon, he will be robbed of all familiar surroundings, bearings and comforts. Bewildered, Thornhill is driven in a Cadillac limousine to a Long Island (Glen Cove) country estate, a large mansion with stone columns and a sign bearing the name "Townsend." In the front hallway, Roger hears about plans for a dinner party, and provokes the two killers: "By the way, what are we having for dessert?" He is escorted into the estate's library and locked inside. A distinguished gentleman, presumably 'Lester Townsend', enters [the man is actually Philip Vandamm (James Mason), a foreign spy dealing in American secrets who has briefly taken over the home of Townsend, a UN diplomat]. Thornhill and the man circle around the room eyeing each other, until the man observes: "Not what I expected. A little taller. A little more polished than the others." 'Townsend' cannot be convinced that Thornhill is not Kaplan, although Thornhill tries to explain the misunderstanding by telling 'Townsend' that he is headed for the Winter Garden theater that evening. Thornhill: And what the devil is all this about? Why was I brought here? Thornhill: Not that I mind a slight case of abduction now and then, but I have tickets for the theatre this evening, to a show I was looking forward to and I get, well, kind of unreasonable about things like that. Vandamm: With such expert play-acting, you make this very room a theatre. My name is Thornhill, Roger Thornhill. It's never been anything else...So obviously, your friends picked up the wrong package when they bundled me out here in the car...I told you I'm not Kaplan, whoever he is! 'Townsend' persistently questions Thornhill about his knowledge of their operations: "I'd like you to tell me how much you know of our arrangements. And of course how you come by this information." They believe he is a secret, mythical federal agent named George Kaplan who moves from city to city, hotel to hotel. 'Townsend' reads a list of his past movements as George Kaplan - the Sherwin Hotel (Pittsburgh), the Benjamin Franklin Hotel (Philadelphia), the Statler Hotel (Boston), the Whittier (Detroit), and then to the Plaza Hotel (presently registered in Room #796, in New York). In the next few days, he is scheduled to travel to Chicago (staying at the Ambassador East Hotel), and then to Rapid City, South Dakota (at the Sheraton Johnson Hotel). To dissuade their misperceptions, Thornhill shows all his proofs of identity: identification cards, driver's license, but they are rejected. Leonard removes a bottle of bourbon from the liquor cabinet for a libation, but the pugnacious Thornhill / 'Kaplan' won't cooperate, refuses to reveal his identity, and provokes them with sarcastic comments: "You drink it. I've had enough stimulation for one day." Convinced of his opposition when he attempts to escape, Leonard pours out a large glassful of bourbon while offering "Cheers," and insists that he drink large quantities to deliberately get him drunk - it is a fitting retribution given his drinking habits. Now totally inebriated, they put him blind-drunk in the driver's seat of a Mercedes roadster convertible on a dark, winding ocean cliff road later that night, expecting him to be the victim of a fatal, drunk-driving accident on the dangerous road by having it run off the cliff. Somehow, he manages to push one of the thugs out of the car, take control of the moving vehicle, and steer it in a wild, harrowing ride down the mountain highway. He frustrates his potential murderers and narrowly escapes death. Fortuitously, his erratic, out-of-control driving attracts a police car that chases after him and arrests him (after accidentally rear-ending his car). Mother, this is your son, Roger Thornhill...No, no, Mother. I have not been drinking. No, no. These two men, they poured a whole bottle of bourbon into me. No, they didn't give me a chaser. He requests that she contact his lawyer and bail him out the next morning. A doctor examines him although it is really unnecessary - Thornhill admits he is "gassed" - totally intoxicated after drinking a massive quantity of bourbon. The next morning before a judge, Thornhill's lawyer argues that "would-be assassins" gave chase and he had to drive "as best he could under the, uh, circumstances." The case is turned over to the county detectives for investigation "to determine if his story has any basis in fact." With a group of detectives and his doting, socialite mother Clara (Jessie Royce Landis, who was actually less than a year younger than 'son' Grant), Roger returns to the Townsend mansion to check out his incredulous story. All evidence of his earlier visit has vanished - the liquor stains have been removed from the couch and there are no liquor bottles in the cabinet; 'Mrs. Townsend' (Josephine Hutchinson) greets him as "Mr. Kaplan" - she treats him like an old acquaintance and chides him for having had too much to drink at the dinner party. She believes he had ordered a taxi back to New York. Thornhill, unable to convince anyone of the truth, is aghast by her fabricated story of the night's events and her deceptive acting: "What a performance!" Roger returns to the Plaza Hotel, persuading his mother to accompany him so that they can learn more about - and possibly locate the mysterious Mr. Kaplan. Thornhill: Well, you lend a certain air of respectability. Kaplan has booked one of the Plaza Hotel rooms, #796, but it hasn't been used for two days. Roger bribes his mother (a habitual practice for an ad man) with $50 cash to adopt a "sweet, innocent look" and ask at the desk for the key to Kaplan's room. "Car theft, drunk driving, assaulting an officer, lying to a judge, and now house breaking," Roger's mother recites a litany of her son's crimes. Thornhill: Good, you'll lose less than usual. I think I'd like to meet these killers. Everyone laughs boisterously at the ludicrous question and joke - except Roger, the helpless victim. When the elevator reaches the ground floor, he escorts the women off the elevator first, using the people around him to escape from the thugs. Clara tries to get her son's attention while he runs from them: "Roger, Roger, will you be home for dinner?" He hurriedly summons a taxicab to take him to the General Assembly building of the United Nations (a symbol of world order and Utopia) - to talk to the owner of the estate where he was questioned. He departs the taxi and ascends a small series of steps. After entering the lobby of the UN building, he proceeds to the waiting area where he informs the lobby attendant that he wishes to meet Lester Townsend, announcing himself as 'Mr. Kaplan' and fully adopting the identity of the fabled man. After Townsend is paged at UNIPO, Roger is introduced to Lester Townsend (Philip Ober) in the public lounge, the Mr. Townsend who lives in Glen Cove, but he is a different Mr. Townsend - not the man Thornhill had seen before! Townsend explains that he has been staying in an apartment in Manhattan for the last month rather than at his empty Glen Cove estate, because the General Assembly is in session. And he assures Roger that his wife has been dead for many years!